UAV of the OSCE Special Monitoring Mission in Ukraine in the conflict zone on the Donbas spotted a modern Russian radio intelligence system TORN, according to the SMM report of June 15. The TORN system was placed near an apartment building in the village of Novohryhorivka, which is located to the north of the occupied Debaltseve. It is worth noting that over the past six weeks, this is, at least, the third case, when the OSCE SMM reports the discovery of the Russian TORN system in the occupied part of the Donetsk region. 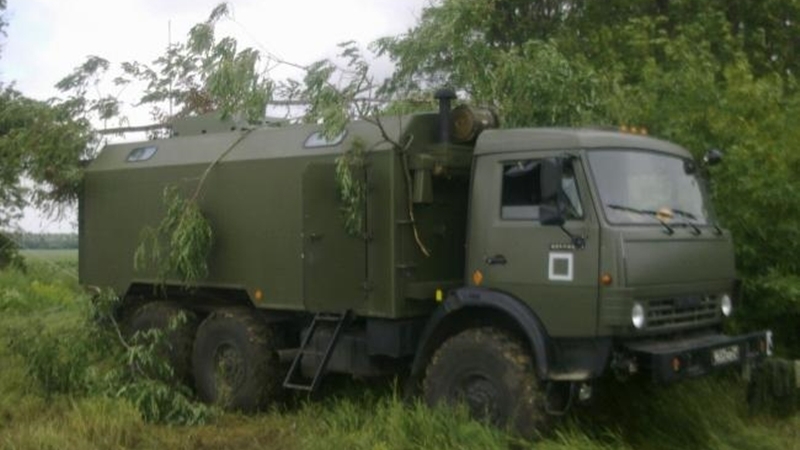 Thus, on June 2 and 7, the SMM unmanned vehicle spotted 2 military type trucks (KamAZ-4310) with an antenna from the TORN radio intelligence system near Debaltseve, which are, apparently, the same trucks. Reportedly, experts from the Informnapalm expert community informed that in August 2015 the TORN system was spotted near the Donetsk airport and provided relevant photo evidence. According to their data, the system is capable to obtain information about the enemy at a distance of 2 thousand kilometers. Reference: the OSCE SMM repeatedly spotted modern Russian weapons in the occupied Donbas: the R-330 "Zhitel", the heavy flamethrower system "Buratino", the portable flamethrower "Shmel", the portable MLRS "Grad-P", the drone Orlan-10 ". The OSCE has also repeatedly asked the Russian side to explain the presennce of Russian weapons on Ukrainian territory, but Russia ignores such requests. Despite the numerous evidence of the involvement of the Russian army and the use of Russian weapons in the conflict zone in the Donbas, recorded by the Ukrainian side and independent international observers, Russia continues to deny its participation in it.